Most offices in Honolulu were closed Friday, June 10, for King Kamehameha Day, but the National Weather Service (NWS) office was open. 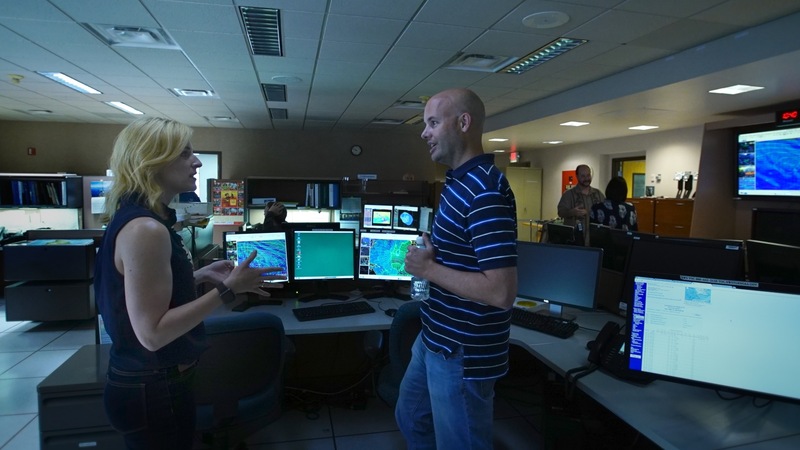 CORAL project scientist Michelle Gierach and project manager Bill Mateer from NASA’s Jet Propulsion Laboratory dropped in to learn about Hawaii weather from the pros. That’s not to say that Gierach and Mateer are amateurs. 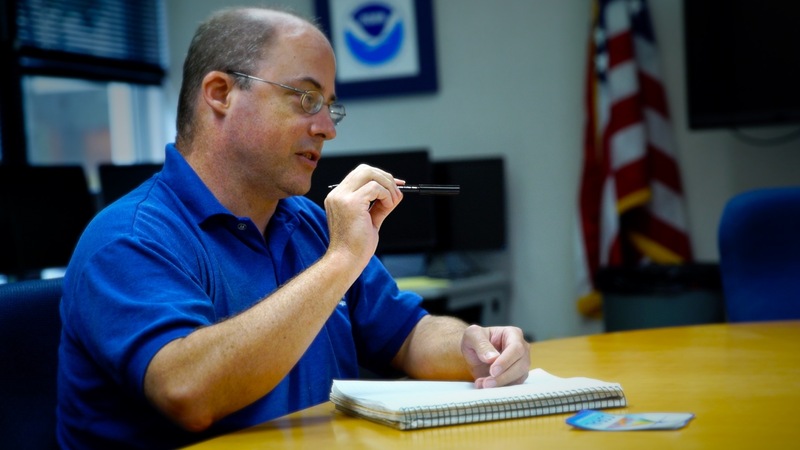 Gierach has bachelor’s and master’s degrees in meteorology, and as JPL’s airborne science program manager, Mateer has an advanced degree and a good working knowledge of weather maps and forecasts. 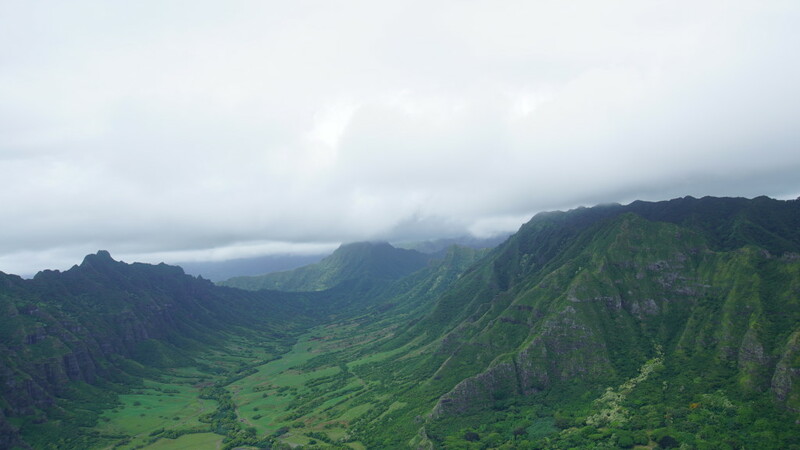 But Hawaii’s tropical climate and mountain terrain offer special weather challenges. “We’re just coming into the region, and they have the expert knowledge,” Gierach said. Weatherwise, the biggest concern for CORAL’s airborne instrument is clouds. On a sunny day, the Portable Remote Imaging SpectroMeter (PRISM) can see the light reflecting off the bottom of the ocean to discriminate benthic cover — the ratio of coral, sand and algae. But the light from the seafloor is only about 1 percent of the total reflected light that reaches the instrument from the atmosphere and ocean below. If cloudy skies obscure or even dim that signal, PRISM can’t produce good measurements of coral reefs. At the Honolulu NWS office, Science and Operations Officer Robert Ballard briefed the JPL scientists on what cloud cover they’re likely to see both this week and when the campaign returns in February 2017 to survey reefs in the entire island chain. “Climatologically, you’re fighting a battle here,” Ballard said. “But you only need clear skies for an hour or two, and there are weather patterns where you get that.” The most common such pattern is light winds with a ridge of atmospheric high pressure over or near the islands. Offshore winds at night blow clouds away from the island so that mornings are generally cloudless. This pattern is more common during winter because the trade winds don’t blow as persistently as they do the rest of the year, so even though winter is rainier, it also has more clear skies. Previous Previous post: In an Airborne Campaign, Why Boats?